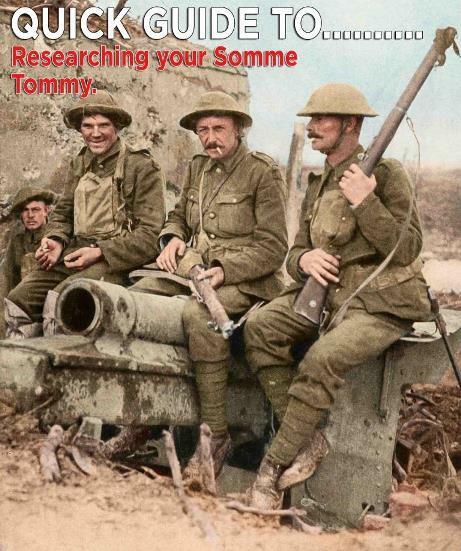 QUICK GUIDE TO - Researching YOUR Somme Tommy. Many hundreds of battalions served during the 141 days of Battle of the Somme, July to November 1916, and as we all know the casualty rate was beyond appalling – with 420,000 KIA and casualties from the British and Commonwealth forces alone. From among these vast numbers it is possible – and extremely moving – to find out more about your ancestor’s role in this tragic and historic battle. But where do you start when researching your ancestor’s service at the Somme? First you need to identify what you already know. If you know the number of the battalion he served in, you can go straight to the Unit War Diaries. If not, you need to track it down, to enable you to pinpoint the precise diary you need to learn where and when exactly his battalion was serving, in this official day-to-day account­. If you don’t know the number of the battalion he served in, you’ll find that many of the records you need to search are readily available online. Alternatively you can visit archives such as The National Archives (TNA), Kew, to explore documents there. Tip: You may find the battalion number recorded in one source but not in another, so search widely. Examine family photos of your Tommy ancestor in uniform extremely carefully. Uniform details, such as cap badges, will help to identify his regiment. Letters and family memories will also provide useful clues to be followed up. It’s much easier to trace the service of a soldier who died in the war, than that of one who survived. If they died visit the impressive free Commonwealth War Graves Commission CWGC website – www.cwgc.org – to find details such as name, service number, regiment, battalion, date of death, and memorial. Unfortunately, approximately 70 per cent of First World War soldiers’ service records (TNA reference WO 363 and WO 364) were destroyed in WW2. But if your ancestor’s records have survived the fire, they will give extensive details, enabling you to identify him by factual information such as him. 81 volumes of Soldiers Died in the Great War, 1914-1919, were compiled in the 1920s by the War Office and include the battalion number. The medal index card collection (TNA references: medal index cards WO 372, and medal rolls WO 329) includes details for about 5 million British service personal – officers and men – who served in the war. Sometimes the rolls provide the battalion number, so it is worth checking the cards and the rolls. In addition to the campaign medals (the 1914 Star, the 1914-15 Star, the British War Medal and the Victory Medal) the exceptional bravery of some people was recognised by gallantry awards such as the Victoria Cross and Military Medal. Search for your ancestor in the Gazettes free at www.thegazette.co.uk. Many injured soldiers returned to the Front line, but those discharged because of their wounds were awarded a Silver War Badge (TNA reference WO 329). In addition to the medal rolls, there are also nominal rolls – lists naming those who served by regiment for the duration of the war – and some of the entries include the battalion number too. The registers record the money that the British Government paid to the next of kin of servicemen who died in the First World War. Look for soldiers’ wills at www.gov.uk/probate-search; soldierswills.nationalarchives.ie/search/sw/home.jsp and scotlandspeople.gov.uk. The casualty lists as reported in The Times provided regular records of those killed, killed, missing, died of wounds and wounded. The officers are named first, then other ranks. The Royal Flying Corps (forerunner of the RAF) came to the fore, taking its most major role so far in the war, at the Battle of the Somme 1916. The nominal rolls, Operational Record Books and the Casualty Lists (found at TNA in AIR 1) will help you trace your RFC ancestors’ service. Squadrons 1, 2, 3, 4, 6, 9, 10, 41 and 70 served at the Somme in some capacity. Hopefully one of the sources above will have helped you to find your ancestor’s regiment and his battalion. Now look through the Order of Battle for the Somme you will see whether his battalion served there in 1916 – see en.wikipedia.org/wiki/Order_of_battle_for_the_Battle_of_the_Somme. The Unit War Diaries are the official military accounts that give day-by-day details of the action, locality, conditions, etc of the battalion. Details are brief, but they make valuable reading, revealing both the monotony and horror of life on the Western Front. They are unlikely to mention your ancestor by name, unless they were an officer. (TNA reference WO 95). Use the place names you find in the diaries and locate them on trench maps. Looking at a map will help you make so much more sense of the diaries. Find trench maps free online at maps.nls.uk/ww1/trenches (TNA reference WO 297 for the Western Front). Background reading is extremely useful for learning about the battle, the key attacks, the strategies and disasters. Look out particularly for regimental histories and accounts written, in the years after the war, by people who were actually there. Discover more about your ancestors with Family Tree, Britain’s expert family history magazine for over 30 years – www.family-tree.co.uk. Start your genealogy journey today. DID YOUR ANCESTOR FIGHT AT THE BATTLE OF THE SOMME? The Forces War Records Dedication Wall has already had more than 1,000 wonderful personal dedications submitted - lasting tributes to loved ones who fought bravely in battle. So don't forget to post (and share) a lasting commemoration to your ancestors on our Dedication Wall today. It's completely free to use, plus you can search for other relatives too!